Released thanks to active participation of Sum Of Technologies. Sum Of Technologies is one of the leading Russian expert in industrial automation, implementing complete cycle of production and manufacturing automation systems from the separate PCS and SCADA to integrated MES/MOM-level systems. Industries Served: Mining and Metals, Oil & Gas, Pharmaceuticals and Biotechnology, Power Distribution, Pulp and Paper/Wood Products. All Beremiz contributions are done as part of development of own embedded solutions for industrial automation. updated license headers and text files. A lot of IDE and runtime bugs have been fixed since 1.1RC5. See beremiz hg log for details. MatIEC compiler also got many fixes. See matiec hg log for details. Beremiz now has a Youtube channel ! 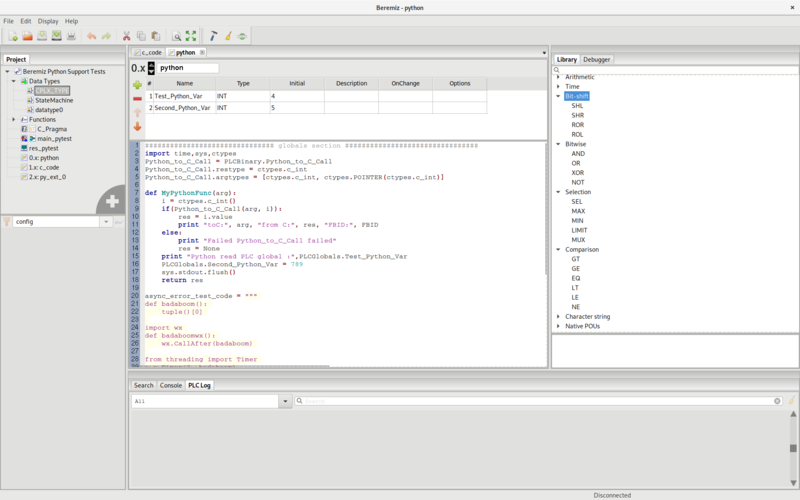 Thanks to contributions from LinuxIT and SSLab, Beremiz GUI is now translated into Korean, and also supports Korean characters encoding for user inputs, and file paths. 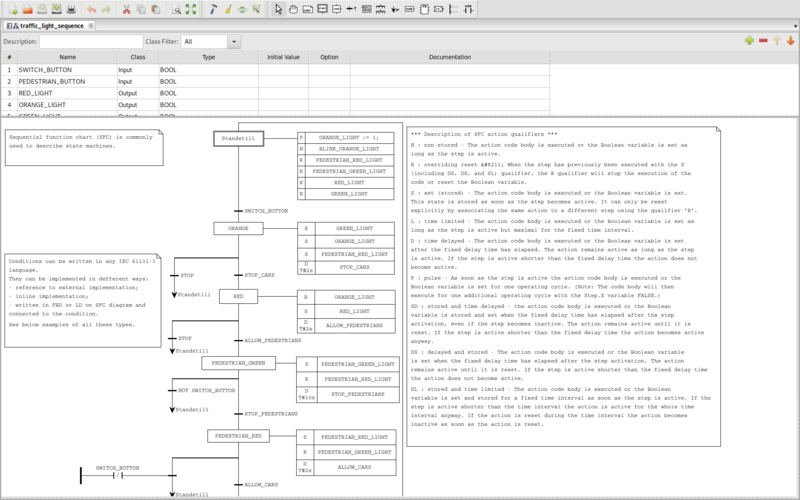 New lxml based internal data model representation. Many queries initially performed in pure Python have been replaced by Xpath and XSLT stylesheets, tremendously accelerating operations, specially with large programs. XSLT stylesheets writing was made easy thanks to YSLT, an incredibly powerful Y Language for XSLT. This was latest Release Candidate. Final 1.1 hasn't been published. Fixes, cleanup and code refactoring. Half a year after RC1, RC2 comes with many bug fixes, but also new features. RC2 re-introduces CanFestival extension in Windows installer, for pedagogical purpose. CAN network is by default emulated through TCP. Connecting to real CAN hardware requires rebuilding CanFestival for your specific hardware. Commercially available CAN interfaces require proprietary DLL that cannot be distributed without authorization. Make heavy use of drag'n'drop. Re-order variables, merge graph together either sharing same time axis or orthogonally in 2D or 3D. Very intuitive. 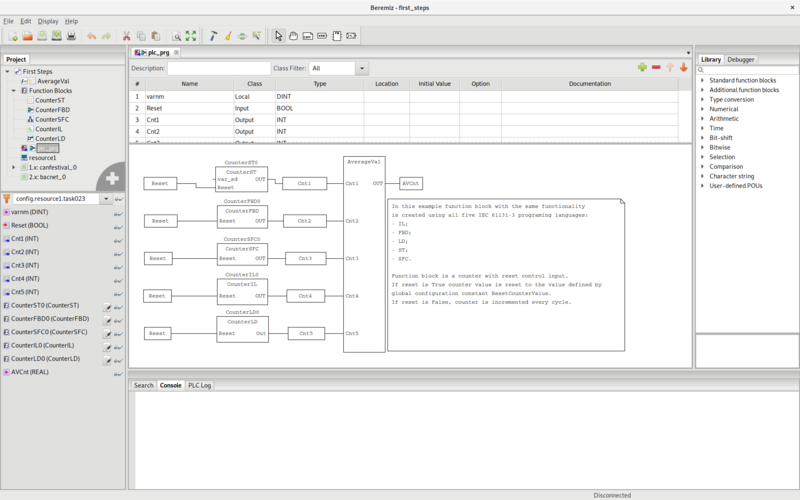 PLC programmer can issue log messages that are stored in PLC memory. 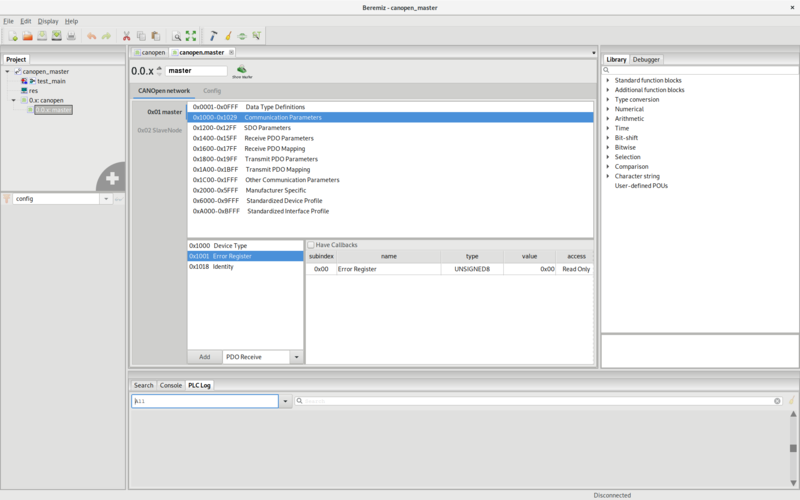 Once connected, messages appear in dedicated log history panel with filtering. Mario de Sousa and Manuele Conti did amazing work on data type checking, flow control analysis, constant folding, array range checking and lvalue checks. Visible part of the refactoring of Beremiz extension mechanism. "Plugins" became "Configuration nodes". 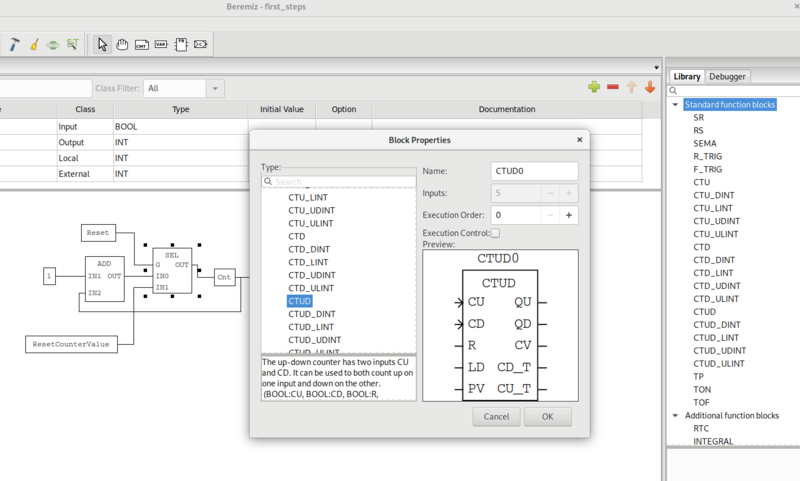 Extensions now provide either blocks, located IO, build system or connectors. Avoids loosing time filling useless names when creating large POUS. Interface layout is restored, last opened project is re-opened, opened tabs and traced variable are saved per-project, and restored upon project opening. A menu item let user reset workspace if necessary. Screencasts and Beremiz related videos are available on Beremiz Youtube channel ! 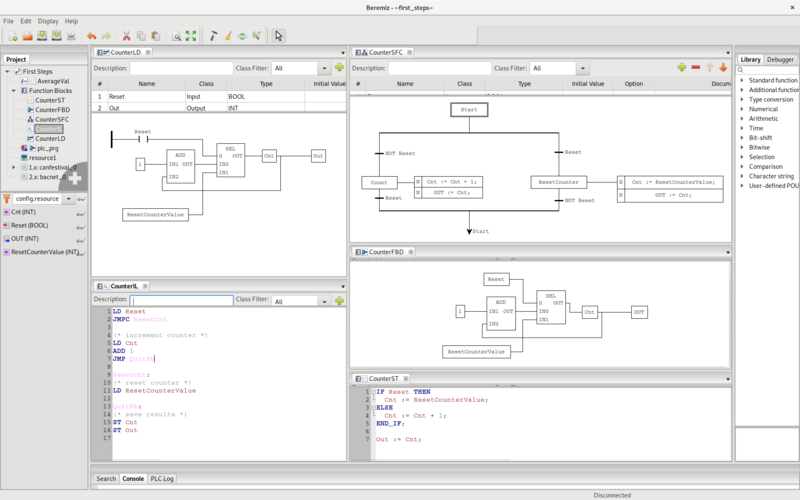 Beremiz is an integrated development environment for machine automation. 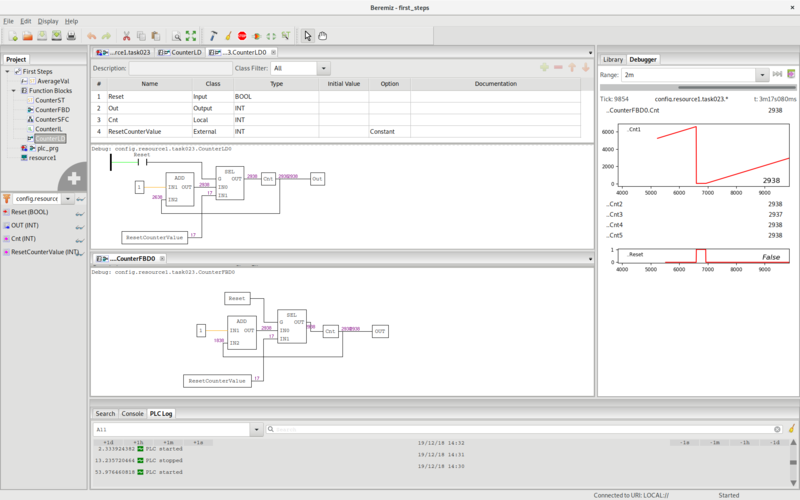 It is Free Software, conforming to IEC-61131 among other standards. It relies on open standards to be independent of the targeted device, and let you turn any processor into a PLC. 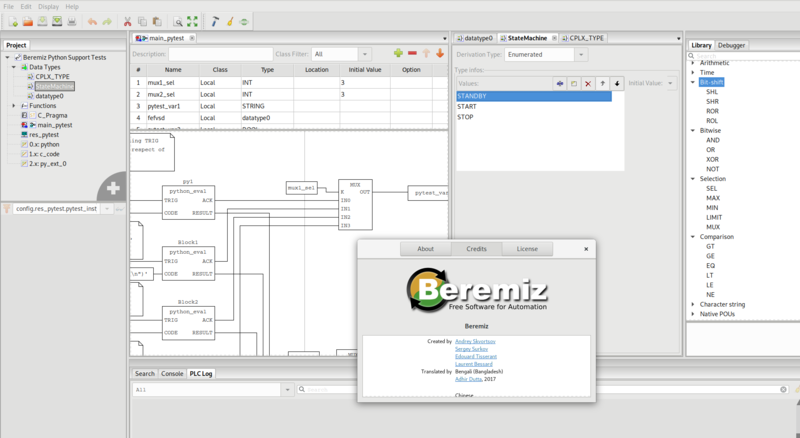 Beremiz includes tools to create HMI, and to connect your PLC programs to existing supervisions, databases, or fieldbuses. With Beremiz, you conform to standards, avoid vendor lock, and contribute to the better future of Automation. 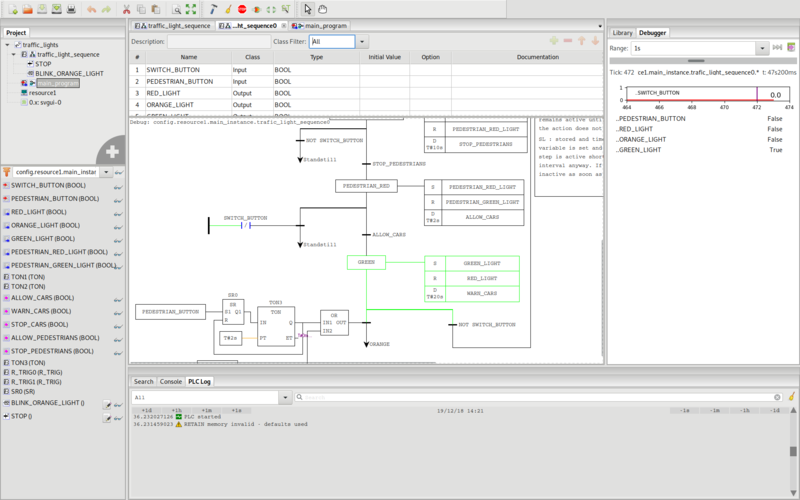 Despite of open standards such as IEC 61131, PLCOpen and CanOpen, control engineers cannot deploy results of their engineering effort in an heterogeneous environment. It is usually required to rewrite your PLC program for each particular PLC brand. The reason for this is that proprietary solutions providers do not fully conform to standards, thus preventing interoperability, harmful to their business model. Furthermore, standards specification are necessarily non exhaustive and leave some "manufacturer specific" freedom to the implementer. Solution providers make great benefits out of those manufacturer specific details, at the expense of the freedom of the end user. The Beremiz Project fills the gap between those independent standards specifications, by providing an integrated reference implementation of them. This moderated mailing list is the main community communication channel. For posting it's required to be subscribed to the mailing list. Searchable webarchive of the mailing list is available here. Note that IRC doesn't support history. If you log out, you'll not get developer's answer tomorrow. If someone is in chat, it doesn't mean he is online. Developers may be away from keyboard, busy or work in different time zone than you. Don't expect to get answer immediately, especially on weekend. Ask question and keep running your IRC client until you get answer. If you don't want to keep running your IRC for at least 24 hours, just ask your question on community mailing list. Official Beremiz bugtracker is https://bitbucket.org/automforge/beremiz/issues. If you've found (reproducable) bug, and want it to be fixed. First search bugtracker, maybe someone already reported this issue. If the issue is already described, you may add your examples or comments to it. If the problem isn't described yet, then please check whether it exists in the latest version of Beremiz from development repository. If it still exists, then create new bug report for it. Exact steps to reproduce the problem, to make it easier for developers to fix it. Generated by Beremiz bug-report with backtrace, if it exists. Beremiz PLC project used to reproduce the issue. Screenshorts/screencasts for better understanding of the problem. Bugs in matiec should be reported here. 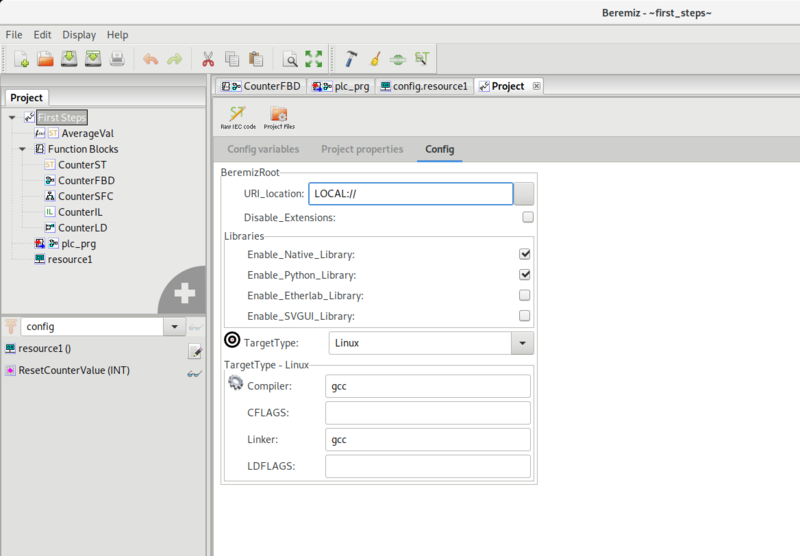 The easiest way for newcomers to help Beremiz project without python knowledge is to improve support of your native language in Beremiz IDE. 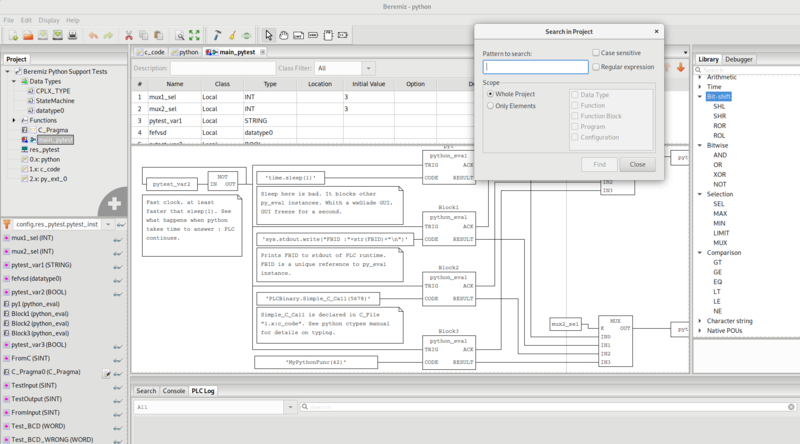 Beremiz developers use Transifex, web-platform for translations. https://www.transifex.com/beremiz/beremiz-ide. It is easy to use and is used by many other open source projects: dpkg, Mercurial, Bitbucket, Fedora, XFCE, PulseAudio, Django and many others. If your language is missing, request it on Transifex. It'll be added ASAP. Beremiz community wiki is here. You are welcome to add/update information there. Another way to help the project is to improve current state of documentation. For example, you can improve description of functional blocks stored in plcopen/Standard_Functional_Blocks.xml and Additional_Function_Blocks.xml. Be aware, that use of any copyrighted material is not allowed. The best way to submit your code to Beremiz is to make pull request on bitbucket to this repo. Before making a pull request please check your code. It should be comform to PEP-8. Commits have to be reasonably small and solve one particular problem each. Commit messages should contain description of the problem that is solved by this change. For matiec please send patches to beremiz-devel@lists.sourceforge.net. This is Beremiz discussion mailing list. For posting it's required to be subscribed to the list. To make it easier to find your patches, please add '[PATCH][MATIEC]' to e-mail subject.